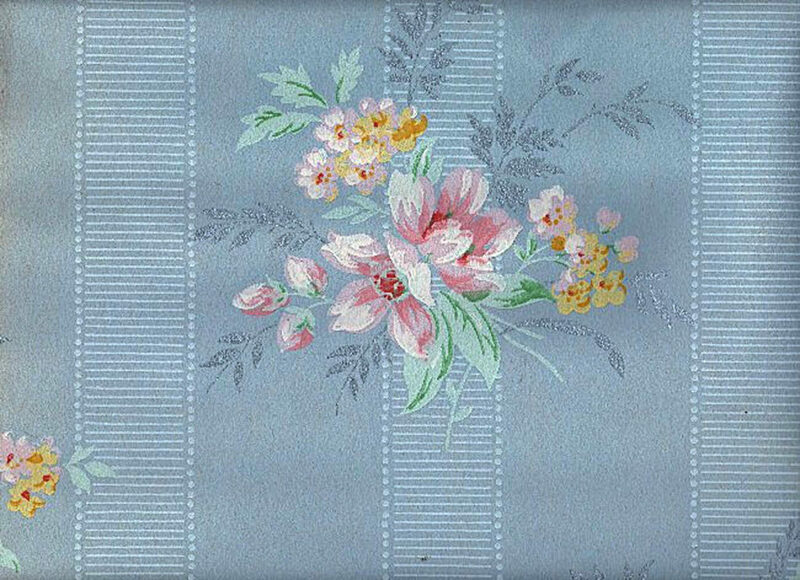 These 12 Vintage Wallpaper samples were among some of the first images that I scanned on my blog. 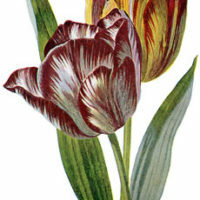 They were beautiful 1940’s Wallpapers, that I had collected over many years as an Antiques Dealer. At one point, I cut the original papers into smaller samples to sell in packs on Etsy, and that is around the time that I scanned these. Unfortunately back then I didn’t have a clue about resolution when it came to images, and so unfortunately the resolution was pretty low. I no longer have any of these papers around anymore, or at least I don’t think that I do as they have not turned up in my latest move, but as luck would have it I did give a number of remnants to Emily awhile back and she still has some! She scanned the ones that she had and I have included Purple Download buttons for those files. For the rest I have adjusted them the best that I can, but they are quite small. If you don’t see a purple download button under a sample that you like, it means I was not able to include a higher resolution file of that sample. I’m consolidating all of these posts together so that you can find them all in one spot. **Also, please read my note about copyright at the bottom of the page. 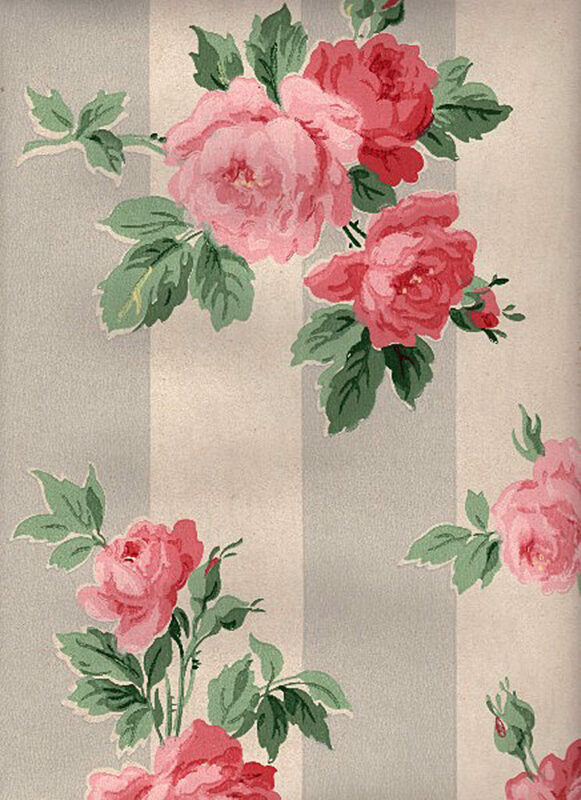 This is a wonderful vintage wallpaper. 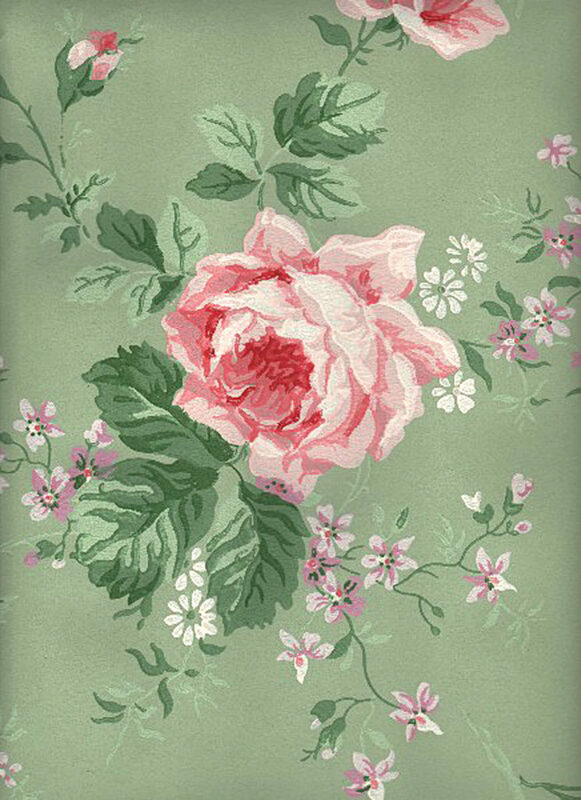 This one has a pretty gray and white striped background, and the loveliest pink cabbage roses with soft green leaves!! I covered a couple of hat boxes with these, back when I used to have my shop, and this pattern was very popular. As I recall I had rather a large roll of this paper. 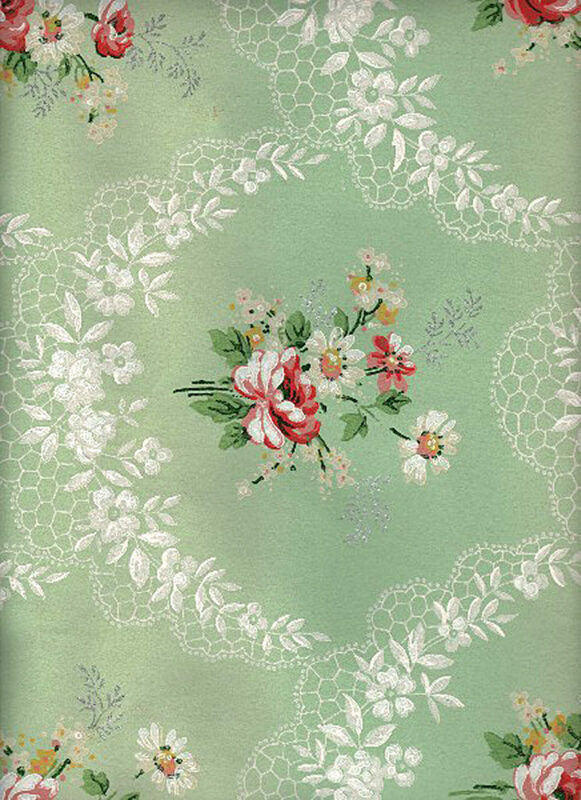 This paper is the prettiest Sage Green color, it has a really lovely Pink Cabbage Rose on it, with Sage green leaves and a smattering of tiny white and purple blossoms. This particular pattern was my all time favorite! I didn’t have much of it, but I was able to trade some of the stripped wallpaper above, with another antique dealer in order to get a sample of this one. In fact, if I remember correctly I bid on the stripped paper at the top of this post on Ebay and I won it. The dealer that owned this sage green paper reached out to me to ask if we could do a swap, as she had been the back bidder to be on Ebay. She told me she was quite put out that I had won it and she was prepared to dislike me, but we became friends after that! Haha! I guess that was back in the day before they used to hide the bidder’s info. That wouldn’t happen now a days. 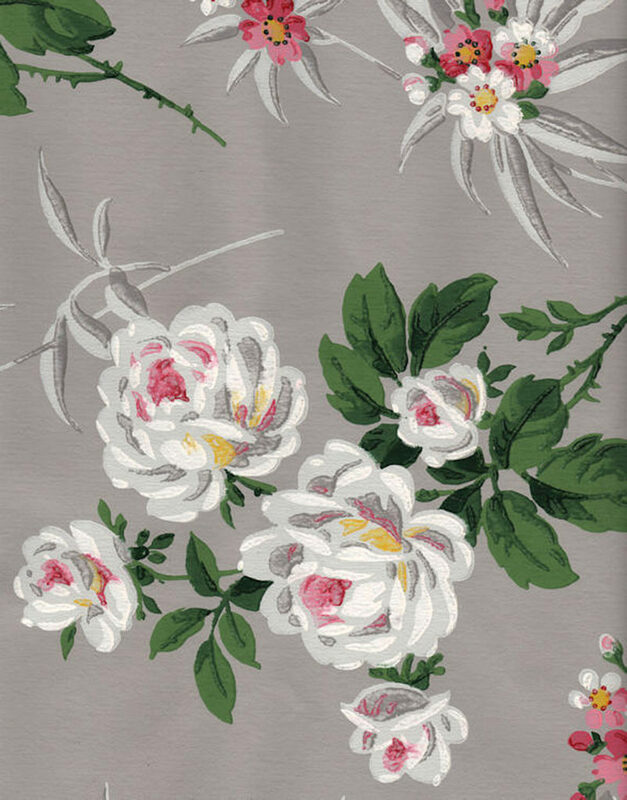 Another lovely paper was this beautiful soft gray version, with white Roses that have pink centers and bright green leaves. This one has such a great garden style look to it. I remember lining a few drawers with this one, on a pretty vintage vanity that I painted from my shopkeeper days. This is another Sage Green Wallpaper. 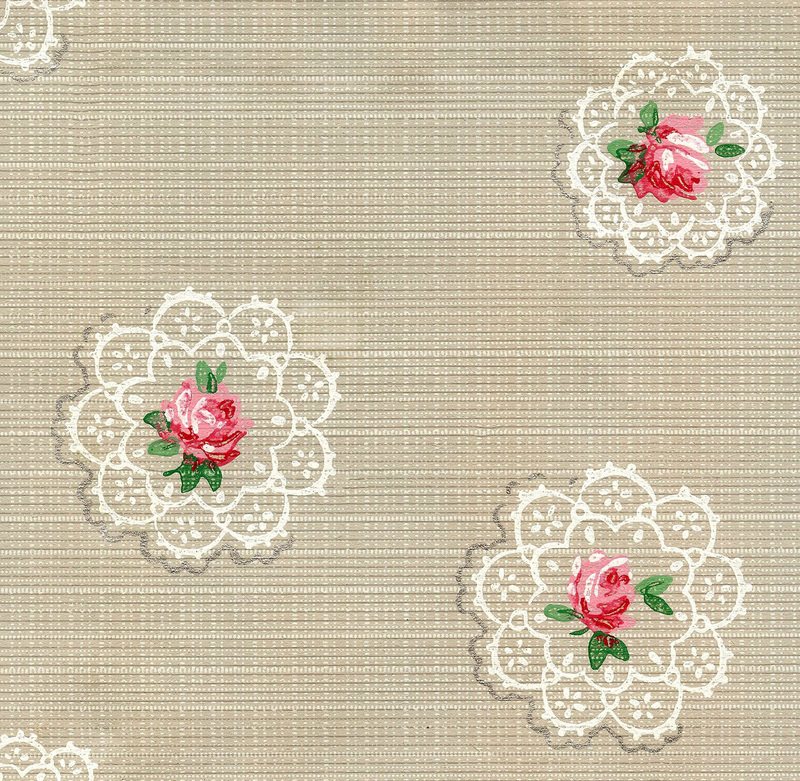 This one is printed with a white lace pattern and has small bouquets of Roses and Daisies inside of the lace. Here we have a cheerful little paper sample! This one shows a faux textured sandy color background, with cute white lace Doileys that have Pink Rosesbuds in the center. So sweet! 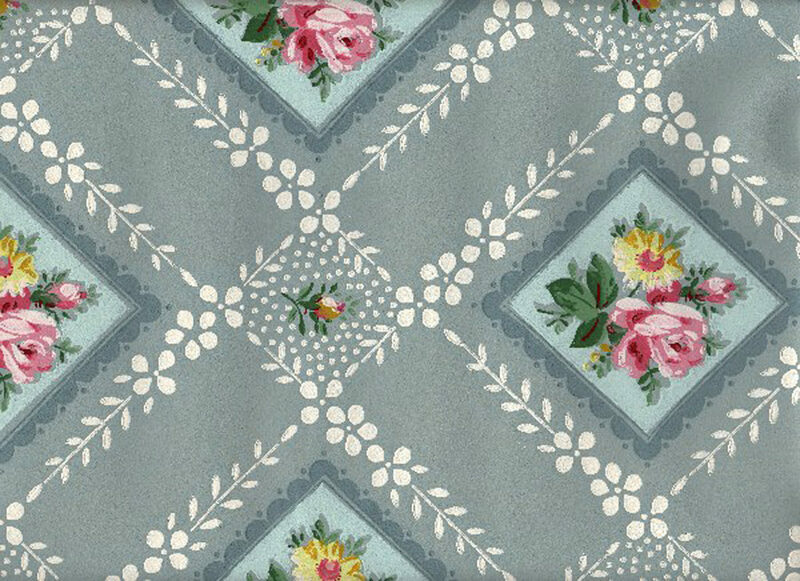 This Blue Paper has a printed white floral pattern on it, that gives a lace like appearance. There are charming pale blue squares filled with pink and yellow flowers on it as well. 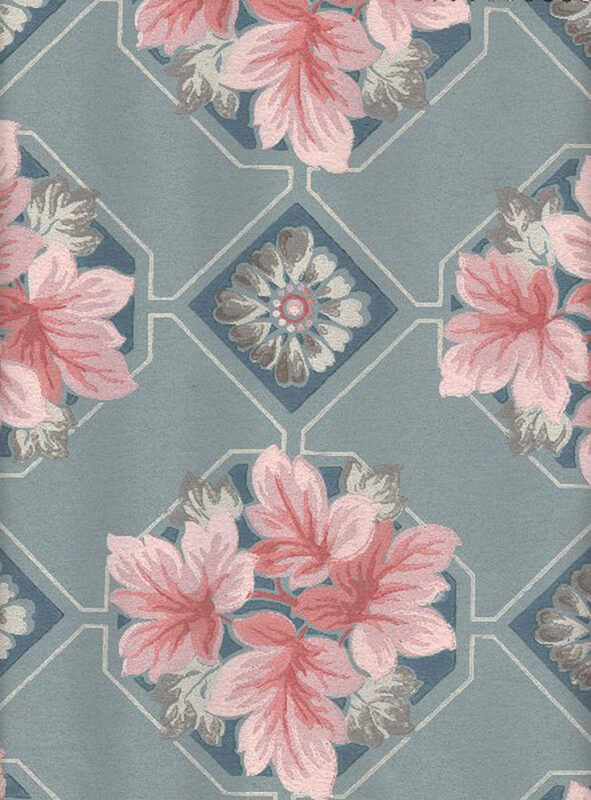 This is a very elegant 1940’s Wallpaper Pattern. My grandparents had a similar paper in their foyer. The colors used here are soft mauve’s and rose. There are some very fancy looking Scrolls and Swirls here amidst the pretty White Roses. This one is a similar style to the one above. 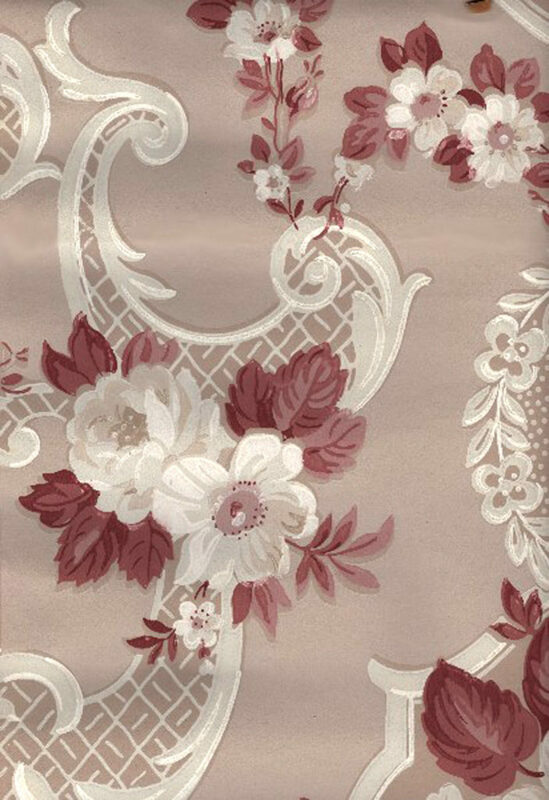 Only the color here is a rich deep burgundy with the White Roses and Scrolls layered on top. It gives the paper a sort of Toile Effect. This one is such a beauty and another favorite of mine! This Vintage Paper has a soft Rose colored background and layered on top are beautiful Pink Cabbage Roses and Lavender Lilacs. Stunning! This soft blue paper is quite charming with it’s small bouquets of pink and yellow flowers. The pale blue stripes doing up down on this pattern, remind me of grosgrain ribbons. 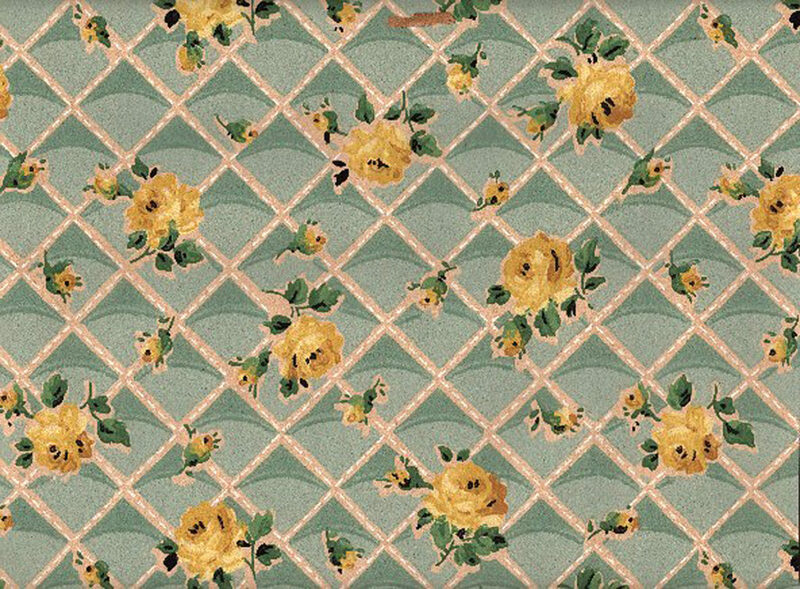 This happy little Wallpaper pattern features tiny cute Yellow Roses on a Sage Green Background. There is an all over diamond pattern that makes me think of a Garden Trellis when I look at it. I once covered a very tiny papermache box with this one. It’s the sort of pattern that you could visualize being used on the walls of a dollhouse due to it’s small scale. And last but not least is this pretty patterned paper. It’s not really a floral Wallpaper pattern but instead it’s leaves. And they are very pretty pink leaves at that, which give them a floral like appearance. The background is a soft blue, almost gray. I think this was one of the very first papers that I purchased. If I remember correctly I purchased it from my old picker, who let me tag along to an attic clean out with him, and this was stashed away under the eaves. It was an exciting find! He told me he would have thrown it out if I hadn’t been there to grab it, as it wouldn’t have occurred to him to save it. Can you even imagine?! It makes you wonderful how many of these lovely old papers are in the landfill now. Ugh! **A word about copyright on these. It’s my belief that most of these papers date to around the 1940’s, judging by the style of the designs, and they were made in the U.S. I really have no way of knowing if the copyright would have been renewed on these, some years later. 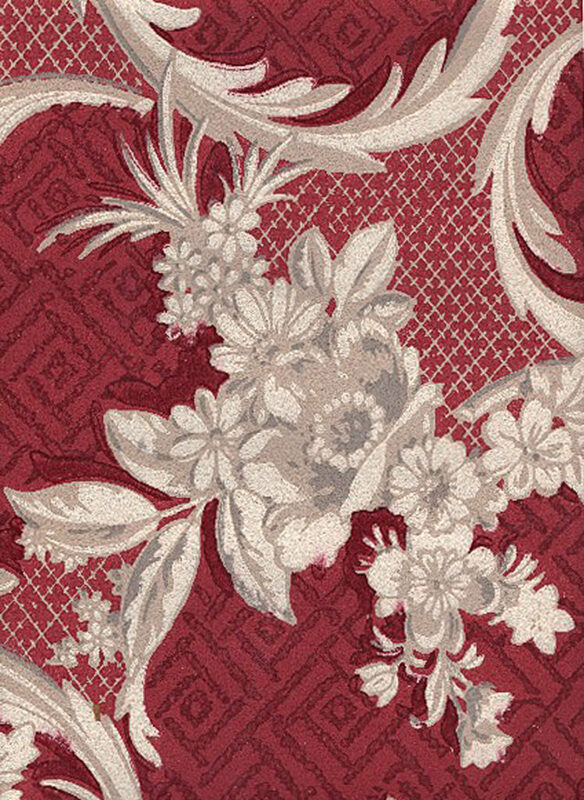 As far as I know there is no database for this and since we don’t know the names of the patterns, no way to research it anyway. It’s possible that as styles and tastes changed rather rapidly over the next couple of decades, that it would not have made sense to renew a copyright on an outdated design of any type. But again, I can’t guarantee that and I just don’t know. So I am offering these as a sort of historical snapshot of these designs for educational purposes and I am going to leave it at that. I hope you enjoy viewing these! Just stopped by to say hi again. You always come up with the best stuff. I don’t know how you do it. I just wanted to say I love your site. I used some of your graphics for my blog and I just love it!!!!! I’m addicted to paper stuff, and the blog just helps me to justify it a little! I’m glad you liked it, I had fun visiting your very creative blog and have added a link for you. Thank you for the sweet comment. Your blog is beautiful, I love your banner! I’ve added a link for you too! Your very welcome. 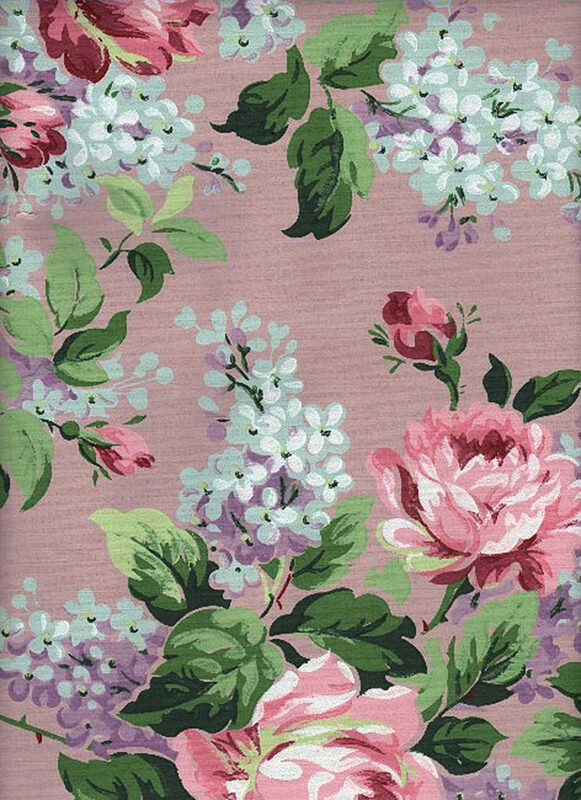 Actually “Rose Garden Romantic” would be the perfect name for that wallpaper wouldn’t it?! Thanks so much for your lovely comment! I hope you can find some things here that you can use in your projects! You’re not going to believe it, but I lived in a victorian house turned into apartments and we had this exact wallpaper in the hall! Too funny. You made me very happy today when I opened my email to find these in the newsletter! I’m a retired interior designer and used the wallpaper books these patterns came from often back in the 80’s and 90’s. So sorry I can’t remember the name of the distributor. Wow, very cool Donna, no worries, thanks for sharing! Hi Gail, I use a regular inkjet printer and any paper will work, good luck!! LOL,you are too funny Patricia, I am so glad you enjoy them so much!